BEIRUTA Jordanian soldier was killed in clashes with armed militants trying to cross the border into Syria on Monday and sectarian clashes overnight in Lebanon left four dead as Syria's civil war spilled into neighboring countries. 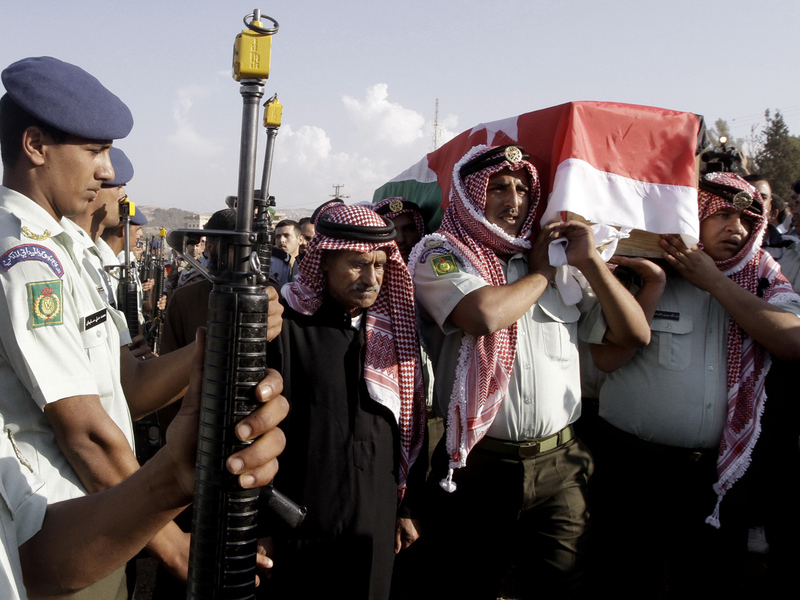 Jordanian Information Minister Sameeh Maaytah said the soldier was the first member of the country's military to be killed in violence related to Syria's civil war. He died in clashes with militants trying to illegally enter Syria to join rebels fighting President Bashar Assad's regime. Maaytah did not say whether the militants were Jordanians or foreign fighters trying to jump into the fray in the neighboring country. A statement by the Jordanian military said the soldier was killed in a shootout with a group of eight suspected militants armed with pistols and machineguns. Jordanian troops detained the suspected gunmen and authorities are questioning them, the statement said. In Washington, State Department spokesman Mark Toner blamed Syria, saying "the onus for this kind of violence rests squarely on the Assad regime." A number of foreign Islamists have been fighting in Syria alongside the rebels. Jordan's banned Salafi movement  which promotes an ultraconservative brand of Islam  has sent several fighters to Syria in past months and Jordanian border patrols have caught some of them recently. In Lebanon, troops launched a major security operation to open all roads and force gunmen off the streets, trying to contain an outburst of violence set off by the assassination of a top intelligence official who was a powerful opponent of Syria. Sectarian clashes overnight killed at least two people. Sporadic cracks of gunfire could be heard in the Lebanese capital as troops began the operation a day after the funeral for the slain official, Brig. Gen. Wissam al-Hassan. Opponents of Syria have blamed the regime in Damascus for the al-Hassan's killing in a Beirut car bomb on Friday. With Lebanon already tense and deeply divided over the civil war next door, the assassination has threatened to drag the country back into the kind of sectarian strife that plagued it for decades  much of it linked to Syria. In the Lebanese capital, soldiers backed by armored personal carriers with heavy machine guns took up position on major thoroughfares and dismantled roadblocks. At times, troops exchanged gunfire with Sunni gunmen. Al-Hassan was a Sunni who challenged Syria and its powerful Lebanese ally, the Shiite militant group Hezbollah. The uprising in Syria is dominated by the Sunni majority fighting Syrian President Bashar Assad, who like many in his regime is a member of the Alawite sect  an offshoot of Shiite Islam. Lebanon and Syria share similar sectarian divides that have fed tensions in both countries. Most of Lebanon's Sunnis have backed Syria's mainly Sunni rebels, while Lebanese Shiites tend to back Assad. The assassination has imperiled Lebanon's fragile political balance. Many politicians blamed Damascus for the killing and angry protesters tried to storm the government palace after al-Hassan's funeral on Sunday, venting their rage at leaders they consider puppets of a murderous Syrian regime. But were pushed back by troops who opened fire in the air and lobbed volleys of tear gas. Meanwhile, cease-fire efforts by U.N. and Arab League envoy to Syria Lakhdar Brahimi appeared to be faltering. Syria's state-run news agency SANA said Damascus supports the truce proposal, but would not commit to halting fire during a four-day Muslim holiday until Western countries and their Gulf allies stop supporting rebels and halt their weapons supplies to the anti-regime fighters. Brahimi met with Assad in Damascus on Sunday as part of his push for a cease-fire between rebels and government forces for the Eid al-Adha holiday, which begins Oct. 26. He told reporters following a closed-door meeting that he also had held talks earlier with opposition groups inside and outside the country and received "promises" but not a "commitment" from them to honor the cease-fire. SANA said Assad assured Brahimi that he supported his effort, but that any political solution to the conflict must be "based on the principle of halting terrorism, a commitment from the countries involved in supporting, arming and harboring terrorists in Syria to stop doing such acts." The U.N. peacekeeping chief, Herve Ladsous, said Monday that the United Nations is already planning for a peacekeeping force in Syria should a cease-fire take hold and pending a Security Council mandate. Ladsous said, however, it is still too early to say how many peacekeepers might be deployed in such an eventual force. Diplomats say that Ladsous has told Brahimi he could put together a force of up to 3,000 peacekeepers in the event a longer truce took hold. But Ladsous said, "it certainly would be premature to mention a figure because it would depend on the situation." He spoke to reporters at a U.N. briefing in New York. EU foreign policy chief Catherine Ashton urged the international community to support Brahimi and his cease-fire proposal. Ashton toured the Zaatari refugee camp Monday, the first day of her five-day visit to the Middle East. Jordan hosts around 210,000 Syrian refugees  the largest number in the region, according to the U.N. refugee agency. The Zaatari camp is home to some 35,000 Syrians. More than 33,000 people have been killed since the uprising started in March last year. Syrian authorities blame the revolt on a foreign conspiracy and accuse Saudi Arabia and Qatar, along with the U.S, other Western countries and Turkey, of funding, training and arming the rebels, whom they describe as "terrorists."